Handmade Cards 002 : Here are some handmade cards I had received from my friends all around the world. 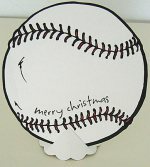 I have boxes of these handmade cards. Occasionally, I will take them out to admire. Ranging from simple to the more complex cards, these are also a great source of reference for me. Through these homemade cards, I learnt from my friends some of the many techniques of making greeting cards. 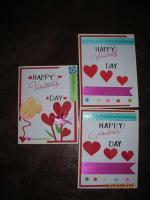 More Handmade Cards To View: You might like to view more of these cards on the following pages. Look at Deb's holiday card. I love it! 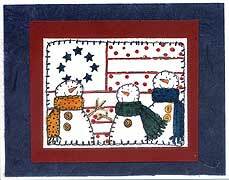 Three snowmen against a quilted flag. Julie K. from Taiwan sent me this trading card with a origami wallet and 1-4-1 stamp. Thank you, Julie. Will use the stamp often. Lovely oriental postcard made by Jody Morrison. 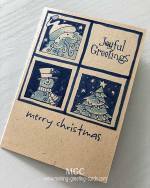 Jody embossed the stamped images on faux wood card. She then edged the card with gold marker. 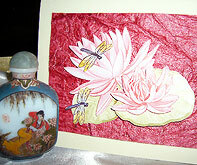 Another of those popular handmade Oriental greeting cards! The fan is made of acetate. Everything is so well co-ordinated. Thank you, Krysia, for the lovely card! Adrienne W. created this beautiful Oriental Card with Chinese red glossy card-stock, washi paper, stamped image and dragonfly charm. Carolyn S. created this beautiful Chinese Birthday Card. I love it. Thank you, Carolyn. 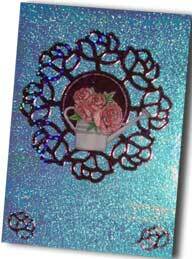 Here's a beautiful shimmering card I received from Linda M. for my birthday. I shown it to my friends and they are just so amazed. One Korean friend said, "You must keep it." Yes, I will definitely treasure it always. Melody C. sent me a watercolored friendship postcard. In fact she sent each of this similar design postcard to our group. Debbie M. stamped the image and coloured it with markers. Then she glued it onto layers of brown, beige and again brown cards. She also stamped the word "SMILE" in black on white card-stock, cut it out and attached to the bottom right of card. The whole artwork is then attached to a plum coloured blank basic card. A simple and clean card that will surely bring a smile to the recipient (ME!). Thank you, Debbie, for thinking of me. Amazing how Linda skilfully cut out these pictures of the water lilies and dragonflies and layered them on top of each other with foam tape. 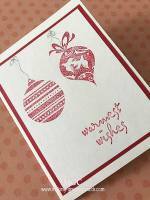 She made the whole piece of artwork to stand out by attaching it to a maroon decorative crumpled paper and then attaching it to the blank basic card. Thank you, Linda for your beautiful card.